My favorite color combination for babies is country blue and white (Caron Simply Soft Yarn). The blue is icy and enchanting. A small amount of white in the trim is the perfect complement to make the blue stand out. 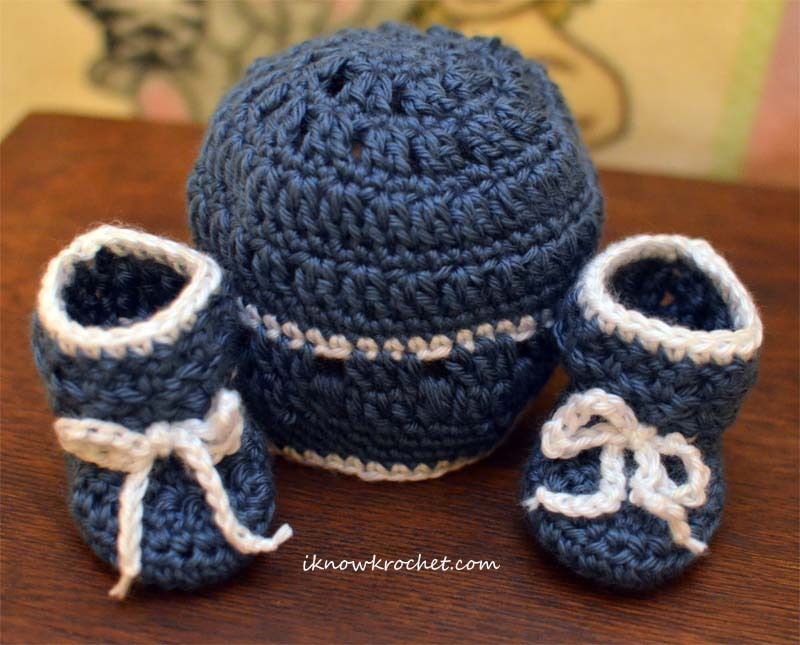 My first ever (and possibly last) commission was a newborn booties and beanie set that my mother requested for a coworker's baby shower. 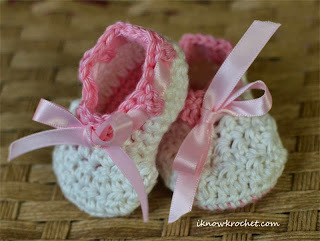 Because my mom requested it, I let her choose (and purchase) the booties pattern, which we found on Etsy. Window shopping on Etsy is one of my favorite pastimes, so it was pretty fun to share this activity with my mom. She made an excellent choice. Not only is the booties pattern adorable, but it extends above the ankle and includes a cute tie to ensure it stays on wiggly newborn feet. I paired it with my first ever beanie. Each of the patterns I used were written as sets, but I mixed and matched to obtain the beanie and booties shown here. The cheapest I have found Caron Simply Soft Yarn is at my local JoAnn fabrics store. I either buy it when it is on sale or when I have a great coupon. I am not affiliated with JoAnn, but wanted to share that I think it is worth joining their mailing list because they regularly send out 40% off coupons (for one regularly-priced item). I would not buy a skein of Caron Simply Soft Yarn for more than $3. For bigger projects, I prefer to purchase this yarn online simply because it doesn't have that "craft store smell" (incidentally, the Caron Simply Soft Yarn at our local store is located right next to the sachets). I only made one minor modification to the booties. I used standard single crochet stitches for the trim rather than what was suggested in the pattern. 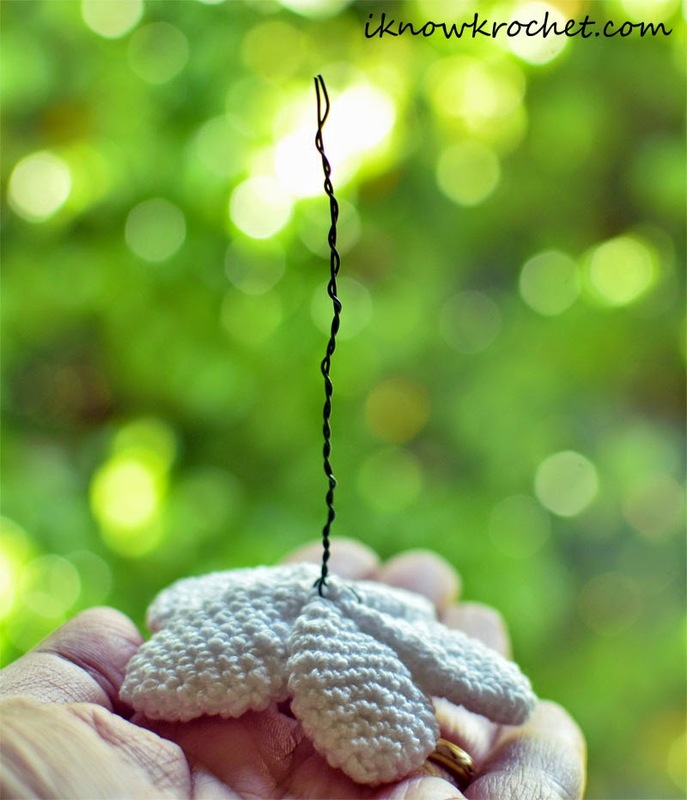 Also, the suggested hook size is 4.0mm, but I moved up to 4.5mm because I tend to crochet tightly. 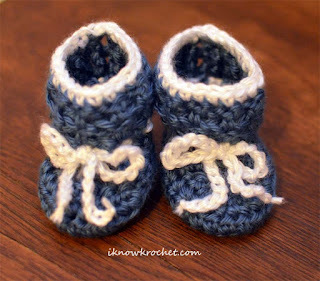 In fact, my first attempt at making these booties turned out an inch shorter than it was supposed to be! Not crocheting too tightly (especially noticeable on booties) has been my greatest challenge thus far. 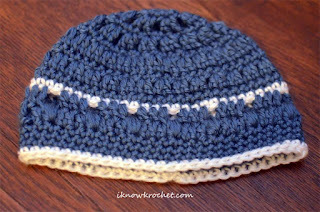 I did not modify the hat pattern, other than selecting my own color combination. There is one stitch in the pattern, a puff stitch, that was new to me and which I found a bit challenging simply because there are so many loops to go through at one time. I found that it helped to make sure I was crocheting loosely and keep my hook straight so I didn't catch the sides when pulling it through. It also helped to carefully pull my hook through one loop at a time if I was having trouble with a particular stitch. 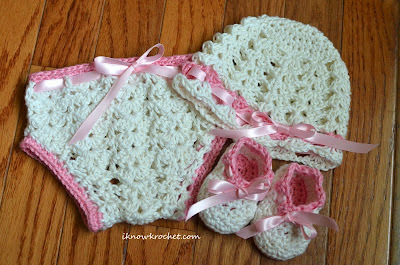 For a link to a tutorial on changing colors in the round, see my lacy crochet summer baby gift set post (scroll to the bottom). Overall, this was a very quick and easy gift for a baby shower. Both patterns are written well and include gauge and stitch counts. I think this set is perfect for a baby boy, but the country blue certainly works for baby girls, too. 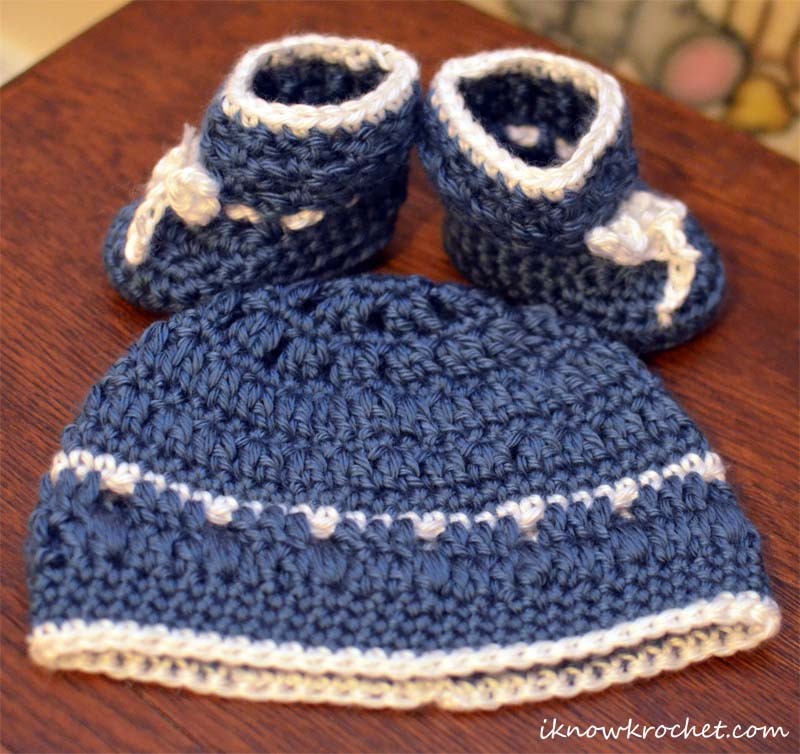 I crocheted this gift set for a December baby last winter, but I think the color combination would also work great for a summer baby (think nautical). What season do you think the country blue and white color combination evokes? My cousin is expecting a baby girl next month. 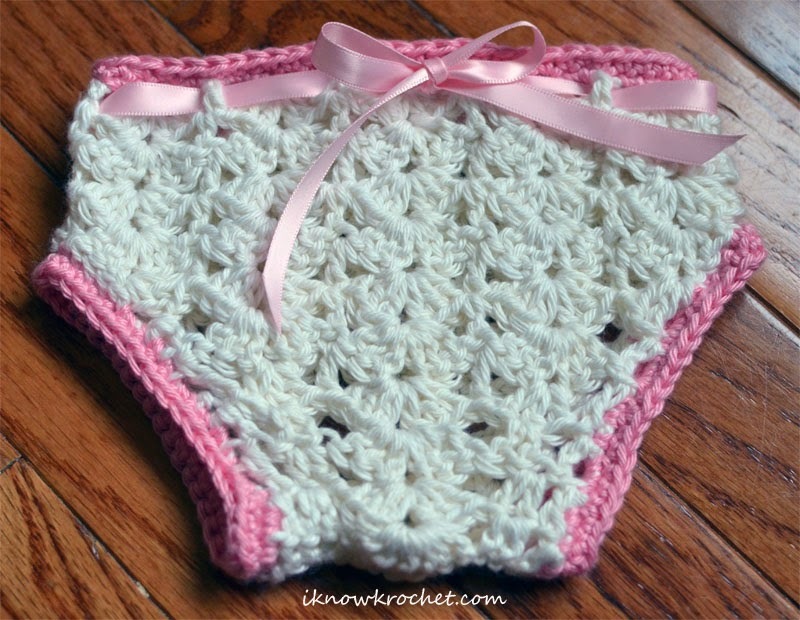 What a perfect excuse for me to crochet something lacy, pink, and embellished with satin ribbon! 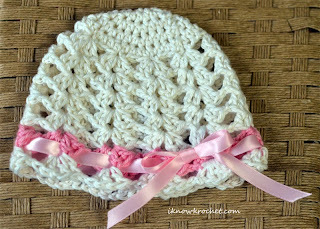 I combined three free crochet patterns to make a lacy hat, diaper cover, and booties set for the sweet summer baby. I found all three patterns on Ravelry.com. 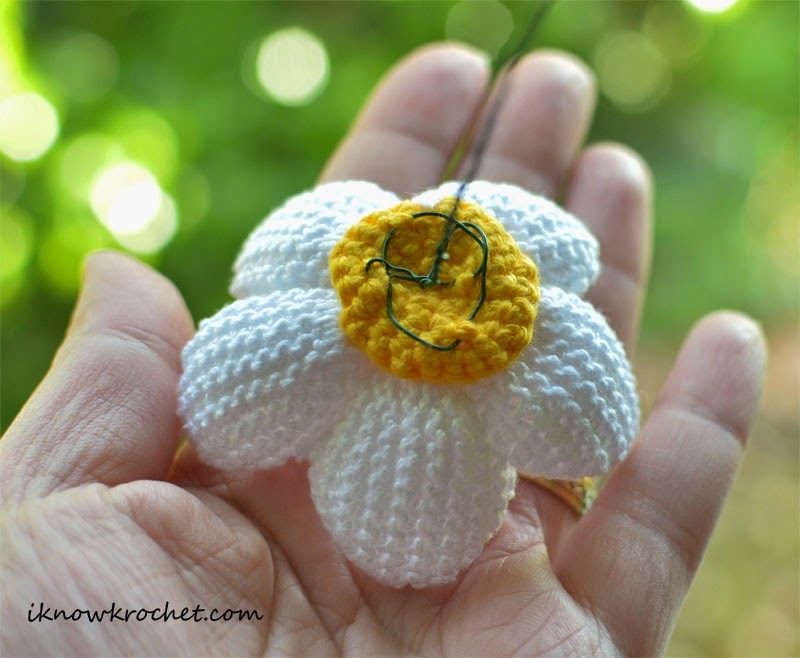 If you are new to crochet, then I would definitely suggest signing up on Ravelry. It's free, and it's a wonderful resource for finding great patterns! It's also a pretty convenient means of organizing and keeping track of your projects. The comfy sport yarn is the same yarn I used to crochet my son's baptism outfit. This yarn is so soft! It is also lightweight (sport weight category #2), mostly cotton, and perfect for warmer, summer weather. The other reason I chose this yarn is because I had two balls leftover from the previous project and I am currently on a self-imposed ban from buying more yarn. This is also why I used the pink shine sport yarn. The shine sport is the same weight and more-or-less the same material (60% cotton rather than 75%). It is true to its name (it's shiny), but I think it complements the soft antique white. This pattern was written for worsted weight yarn. In order to compensate for the fact that I was using sport weight yarn, I followed the 3-6 month pattern and used a 5.00 mm hook, with the goal of the final dimensions matching a newborn size. The smallest head the hat should fit is 12 inches around, but the pattern has a lot of stretch potential, so I'm hoping that it grows with the baby for at least a few months. I replaced the crocheted bow from the pattern with pink ribbon. Here is yet another Lovely Crow pattern. (What can I say? I'm a fan.) This is another great pattern with lots of close-up pictures. What makes this Lovely Crow pattern extra special is that it is FREE on Ravelry. This pattern was also written for worsted weight yarn, so I simply followed the 3-6 month instructions with the idea that it would fit a newborn using sport weight yarn. This is one of the reasons I greatly appreciate patterns that include multiple sizes! Rather than adding an elastic band, I used a ribbon to tie the waist. Note: This pattern includes an excellent pictorial tutorial on how to do an invisible join when finishing off (I used it in every piece of this set). This is a great beginner pattern. I found it very easy to follow. My booties ended up half an inch shorter than they were supposed to be, but hopefully they will still fit a newborn (I should have checked my gauge first and used a larger hook). Since the pattern was written for lightweight yarn, I did not alter it, at least not for sizing purposes. I made the soles (first three rows) pink. 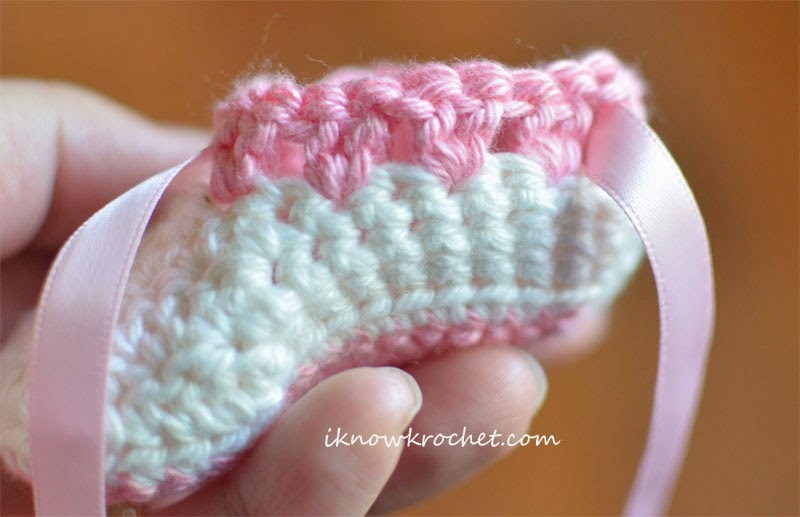 I wanted to add a ribbon, so I replaced the last row with double crochet stitches in a pattern that looks similar to what was used in the other two pieces. I threaded the ribbon through the spaces and tied a bow in the front. I think the ribbon turned out to be a bit too wide for the booties, but I kept it to ensure that the set matched. Note: Usually when I change colors, I just crochet over the loose ends to avoid having to weave them in later. However, with the lacy hat pattern, I found that the yarn shows up in the spaces when I do this. Therefore, for the hat and the last row on the booties, I left all of the loose ends and wove them into the first shell stitch cluster. It was a lot of weaving, but I think it turned out cleaner looking. I did something similar for the diaper cover, but in hindsight, realized that I should have just woven the ends into the areas that were going to be covered by the edging. I can't wait for my cousin to see this pretty gift set! 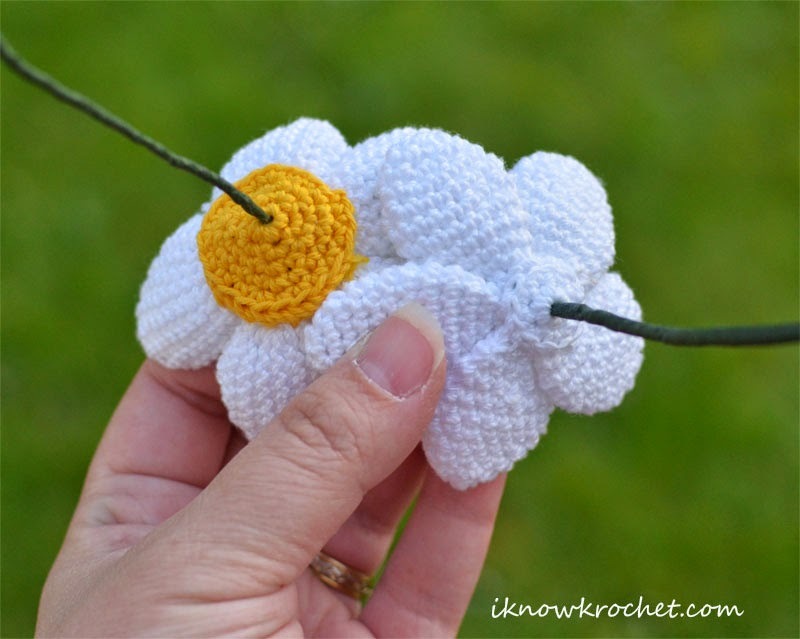 Are you crocheting a gift for a summer baby this year? I love giving flowers on Mother's Day. The only problem with this gift is that live flowers don't last very long. 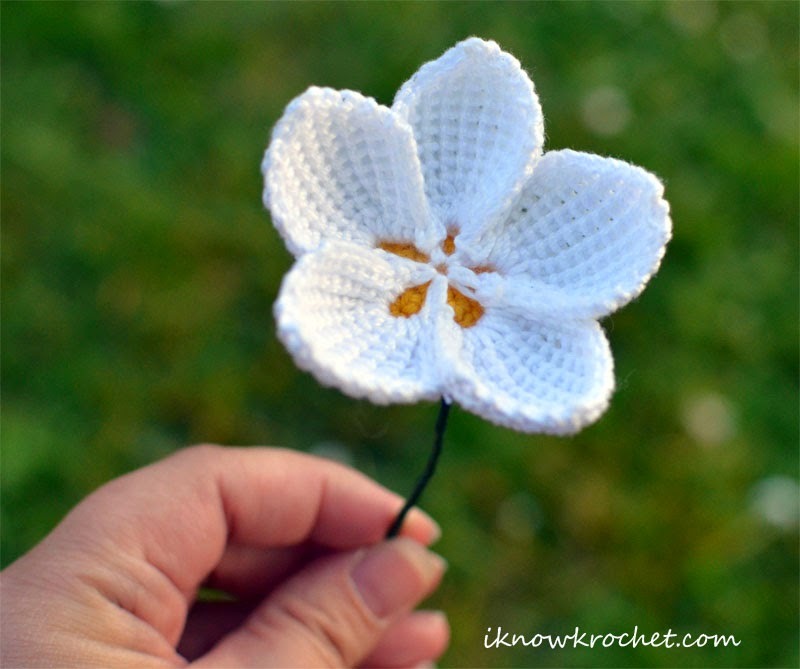 Well, I've found the solution to this: crochet flowers! 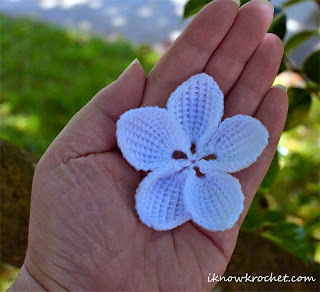 This year, I made each of my grandmothers a crochet flower for Mother's Day. My favorite flower is the plumeria. I love its simple perfection, rounded edges, and silky white petals. 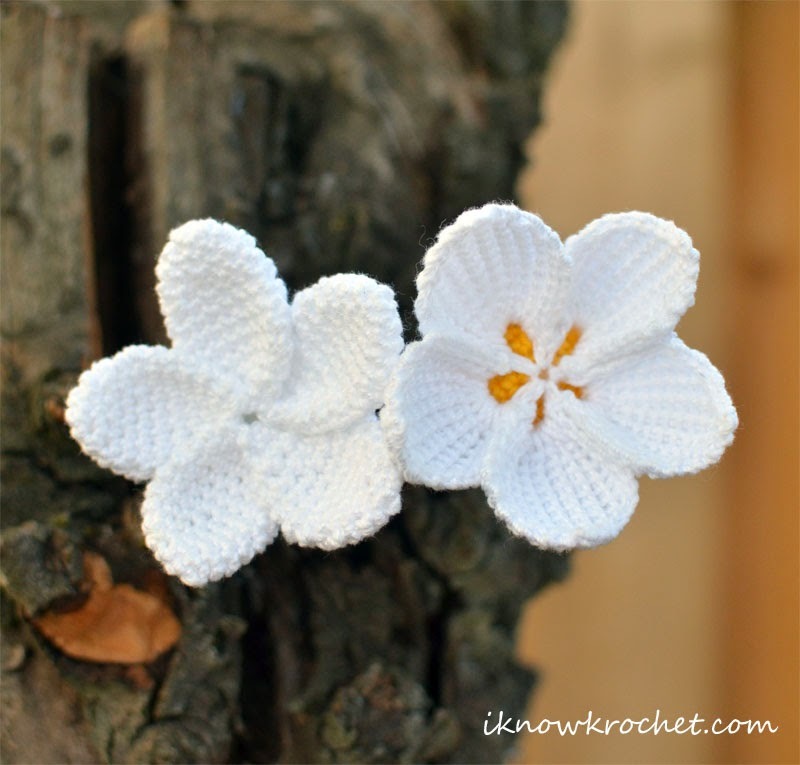 Plumeria are fun to wear behind the ear and the crochet version would look beautiful behind the ear or as a hat or hair adornment. I found two amazingly lifelike crochet plumeria flower patterns. I could not pick just one, so I made one of each. This flower is so pretty and delicate. I absolutely love how it turned out. Happy Patty has appropriately labeled the pattern as being best suited for an intermediate skill level. This is based partly on the use of a special stitch, and perhaps partly on the fact that she suggests using crochet thread size 20. If you have never worked with this size, let me tell you it is the same thickness as sewing thread! When I attempted the flower using this thread and a 1 mm hook, my eyes crossed and my hand cramped. I simply could not physically handle working with such tiny thread. I switched to crochet thread #3 and was very happy with the resulting flower, which was approximately 3 inches in diameter. I must note that my hands still cramped a bit using the #3 thread and 2 mm hook. Part of this is due to my tendency to grasp everything too tightly, especially when working on physically small projects. The special stitch is a modified version of Tunisian crochet stitch. It is fun to do and pretty easy once you get the gist of it. Happy Patty includes a link to a video tutorial with her pattern, but it's a bit difficult to see what she's doing on account of the very tiny thread and hook she uses. I would suggest finding a Tunisian crochet stitch tutorial if you are unfamiliar with this stitch. The tutorial should help you get the gist of it. Just remember, Happy Patty modified the stitch, so it is not exactly like the standard Tunisian crochet stitch. 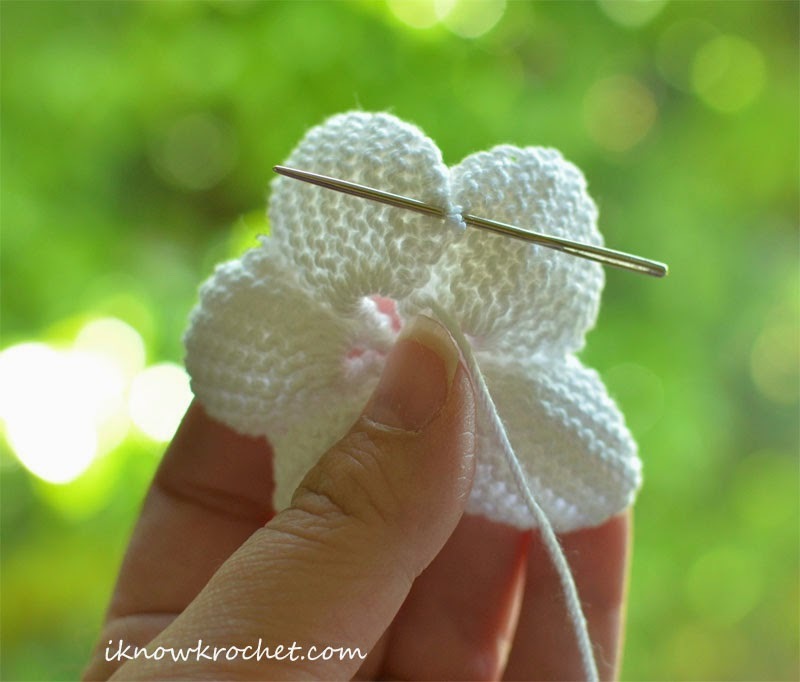 The pattern was relatively easy to follow, although I had to complete a few petals before I felt confident that I was doing it correctly. I think that if Happy Patty had included a few more details on the pattern, then it could be followed by an adventurous beginner. For example, I find checkpoints such as "you should now have 7 loops on the hook" or photos showing exactly where the hook needs to go to be very helpful from a beginner's perspective. The great thing about the pattern is that it includes a written description, detailed close-up photos, and a stitch diagram. This helped for parts in the written pattern that I wasn't sure about because I was able to refer to the photos and diagram to make sure I was following the pattern correctly. My completed flower was beautiful, but a bit floppy. 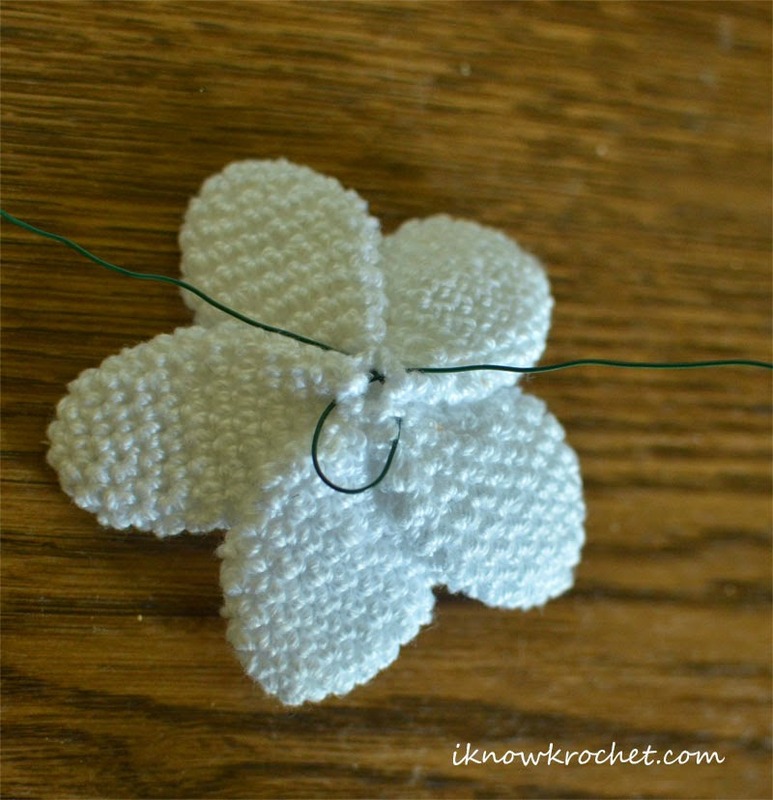 Although the pattern is written so that the petals overlap, mine did not stay in place, so I added a tiny stitch between the petals (using size 20 thread to minimize visibility) to secure them in place. I simply tied a square knot in the spot shown in this photo and cut the ends very close to the knot. I also thought that the holes in the pattern center provided a great opportunity to add some color. I did not have yellow thread in the same size, but I did have some Lion Brand bonbons (100% cotton in the "beach" package), which is only slightly thicker than the #3 crochet thread. I used the Lion Brand yarn to crochet a slightly conical backing to place behind the flower center. I sewed the yellow disc to the back of the flower using the yellow yarn tail. Next, I threaded 10 inches of florist wire through the disc (making sure to place it so that the wire did not show through in the front). I left two equal ends that I twisted together to make the stem, then wrapped it in florist tape to make it pretty and cover the sharp ends of the wire. Finally, I added a second yellow disc to cover the unsightly wire. In hindsight, it would have made more sense to make the second disc white. This pattern was very easy to follow and I got it right the very first try. The pattern includes complete instructions including a small backing. The only modifications I made were using crochet thread #3 instead of worsted weight yarn (giving a 3-inch diameter flower), and adding a stem using the same technique described above. I hid part of the stem with the backing. This flower turned out very cute and lifelike. 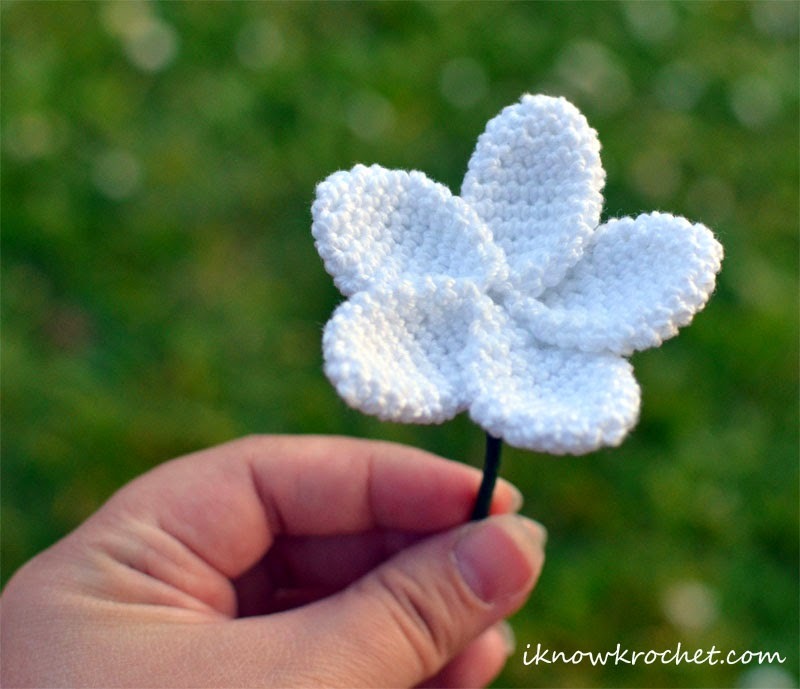 I made an all-white flower, but I think it needs a yellow center. June provides instructions for doing this on her blog. Here are the finished backs of both flowers. I secured the magic circle after threading the stem through the center of the backing. Overall, I prefer Happy Patty's plumeria flower for it's delicateness and the fact that it can be made in a single piece. However, there is a learning curve with the pattern and it requires reinforcement in order to be used as a stand-alone flower, such as one you would wear behind the ear. Planet June's plumeria is also very beautiful and the pattern is very easy to follow, but requires assembly. 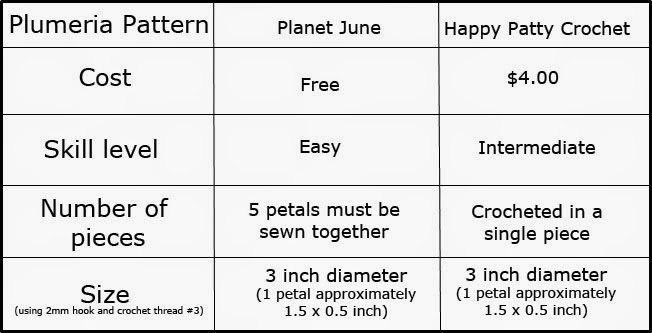 Planet June's flower is very robust and will hold up to a toddler's handling, which is a huge plus in my house. Once I figured out Happy Patty's pattern, it took me about the same amount of time to make each flower. 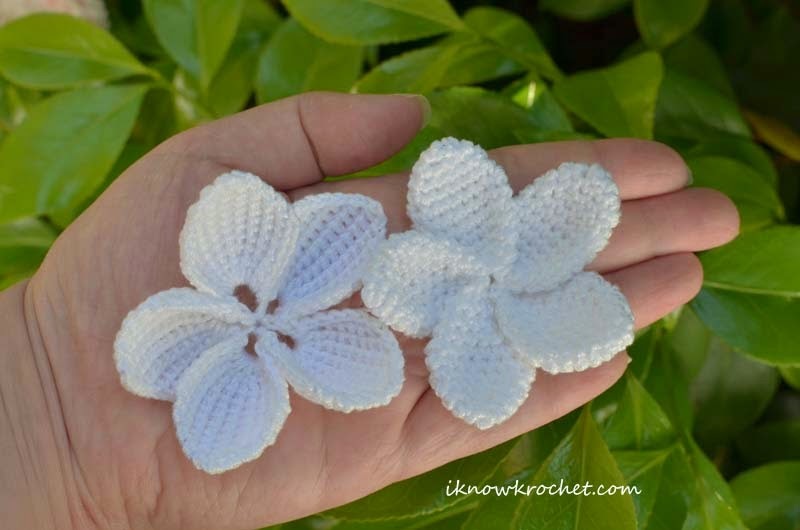 I love both of these patterns and will be making many more of these crochet plumeria flowers to be enjoyed by moms of all ages for years to come! Which plumeria flower pattern are you going to try first?